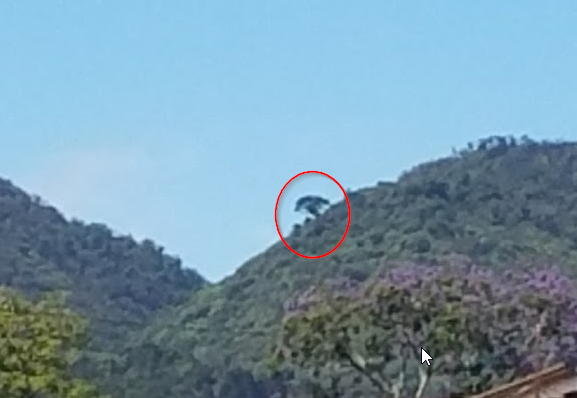 How can I get a GPS location for this tree on a distant hillside? I want to hike to the base of this tree (circled in red in the photo). That's a hillside full of full grown trees beneath it, and it looks like over a full tree's height sticking up above the other trees. It's got to be enormous. So how do I get a GPS location of this thing on a hillside far away from me? I could probably hike to the tree, but as soon as I enter the forest, I'll lose all visibility of this specific tree. Are there apps that could help me with getting a GPS location for a distant object? Maybe some kind of surveyor app? Any other ideas on how to get there, other than using a GPS location? This tree is near the edge of a rain forest reserve of approximately 500km² in Costa Rica. So getting to this spot through the forest will necessarily be winding and steep, if not altogether physically impossible (for me, at least). The only available views of the object are from kilometers away with a residential area between. Noting the two factors above, moving in a straight line towards the tree along a bearing is not an option. There are a number of different ways to do this. Method using GPS, compass and Google Earth. Get the GPS coordinates of where you can see the tree from. Take a bearing with a compass to the tree from that location and write it down. Move to another location a decent distance away from the first where you can also see the tree. Take another bearing with a compass and write that down along with the GPS coordinates. Import the GPS locations to Google Earth. From the two locations, use the line tool to redraw the bearings. Find the GPS location where the bearings cross. Use the GPS to navigate to the location found in the step above. Here is a screenshot of what this method would look like. Method using just a GPS. Take a guess of how distant the tree is. With the map on the GPS orientated towards the way one is facing, point the GPS at the tree and move the cursor out equal to the guesstimated distance and mark a waypoint. Note - The following methods probably won't work for your situation after you updated the question with more information, but they might work for someone else with a similar problem, so I am leaving them here. Method using GPS and compass. Mark a waypoint at your current location with the GPS. Set the GPS to navigate to the waypoint you just set. Take a bearing to the tree. Begin walking toward the tree keeping the bearing to the waypoint directly opposite (180 degrees) to the bearing you took to the tree. This means that you will walk in a straight line directly towards the tree. (This technique is known as taking a back bearing and is more fully described in another Q&A. Method using just a compass. Follow bearing until you arrive at the tree. 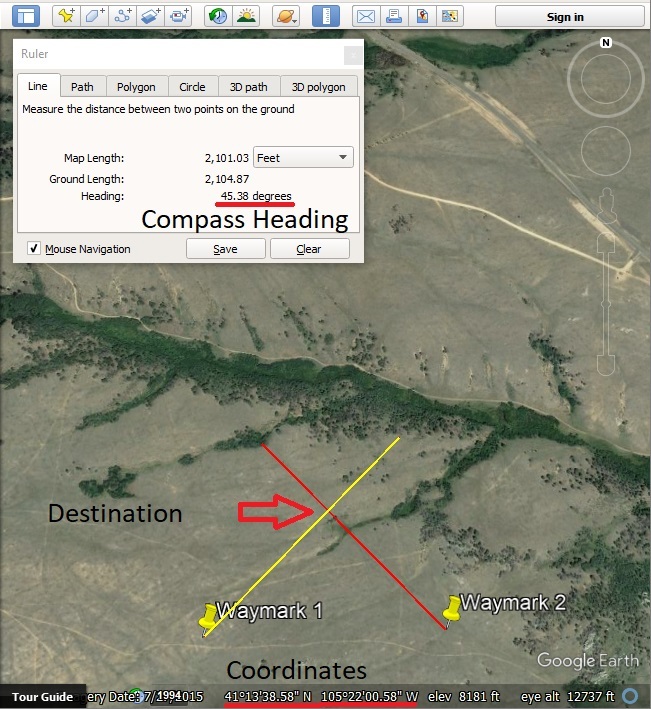 Take two compass bearings from two known GPS coordinates but different azimuths. Then just use the formula to calculate their intersection. The points 1,2 and the (if unique) intersection 3 form a spherical triangle with interior angles abs(ang1), abs(ang2) and ang3. To find the pair of antipodal intersections of two great circles uses the following reference. First thing I would try is to see if I could pick the tree out on Google Earth. In many locations, especially near mid-sized or larger towns and cities, even the tree canopy is modeled in 3D. If your tree is located in such a place, it would be easy to pick out and retrieve the coordinate. You’ve consistently maintained that you want to get the gps location of that tree, and you’ve said that the displayed view is the only one available and eliminated any method that uses a second line of view, including google earth. Since you’ve restricted yourself to the one line of view, you would have to get an accurate range, compass bearing, and elevation angle to the tree of interest and then compute the relative location and add it to the location you took the bearing from. You could try a good drone with a GPS and a pair of binoculars and get the GPS location that way. It’s also possible you’ll merely have 2 sets of GPS coordinates to visit so you can pick up the drone as well. Despite your protestations and limited faith in satellite photos, I think you’ll find that if you enter the coordinates you compute into Google Earth and find an anomalous piece of the forest canopy very near to them taking the GPS location of that anomaly as a second GPS waypoint for your trek might be productive. All that said, this trek can’t depend on locating the tree solely by GPS. As an early post pointed out, GPS position accuracy is under forest canopy in hilly terrain is not what it is on open flat terrain. Your GPS position may be 15m or more in error. If, as you’ve alluded, you believe the canopy is so dense that you could be 50 feet from this tree and not see it from the ground, you might want to plan to walk a spiral search pattern that guarantees it will appear within your sighting distance. On the other hand, if you believe you won’t be able to tell when you’re standing next to it, and without climbing it you won’t know if it’s the right one, then you must intend to climb the tree so be prepared to climb two trees, and use the first to find your preferred tree. If you don’t intend to climb the tree and it won’t look any different from the ground, then this is a fool’s errand anyway, just walk 100m, hug the nearest tree, and return. This technique allows you to find the coordinates of the tree from wherever you took your picture, with nothing but a GPS, compass, and topographical map. Because the tree is highlighted against the sky, it must be near point p with the largest value of r.
OpenStreetMap wiki describes a technique called aimed straight segments. You need a GPS device or app that can record a trace and show it on the map. Start from a location where you can see the tree from. Choose some object that appears directly downwards from the tree, it could be e.g. a mailbox or similar. For greatest accuracy, you could use a string and a weight to accurately judge "directly downwards". Closing one of your eyes can help also. Walk to that object. Your GPS device will draw a line that will point to the object. Repeat starting from another point that is further away. Ideally it would be at 90 degree angles, e.g. if your first point is to the south from the tree, next point could be to the east. Load the GPS traces to PC and find the intersection point. Another answer describes a good method for triangulating a position from two or more viewpoints. This is a method you could use if you have only one viewpoint, but also have access to a topographic map. In this case, the tree is clearly visible because it projects from the limb of a hill. This is a significant topographic feature which should be easy to identify on a map. Many maps intended for hiking have contour lines to indicate the steepness of the terrain. On such a map, plot the position of your viewpoint (obtained by GPS), and from there, the bearing of the tree - not forgetting to account for magnetic deviation. Limbs of hills along this line exist where the contours run parallel to the bearing line; your tree will be near one of those spots. From the contour lines, you can also deduce your viewpoint's elevation and those of candidate locations. Divide the elevation difference of each candidate location by the distance to it, to obtain an estimate of its relative visual height. The correct location will be the candidate with the greatest visual height. Bring a friend along and wear highly-visible clothing. Have the friend stay at a vantage point from where the tree is easily visible. Walk in the general direction of the tree, making sure that the friend can still see you (hence the highly-visible clothing). When you get near the tree, have them guide you towards it. When you reach the tree, take its GPS reading and send that to the friend so that they can hike up to the tree themselves. Alternatively, have the friend be the one wearing the highly-visible clothing and hiking towards the tree, and you be the one guiding them towards it. Point a laser rangefinder at the tree, noting the distance it gives to the tree and the angle it's pointed at (remember that you'll have to take into account the vertical as well as the horizontal angle that it's pointed at). You can then use these measurements to calculate the exact location of the tree (yay trigonometry). If doing so is legal, paintball the tree. Walk to the tree that has paint on it. Not the answer you're looking for? Browse other questions tagged hiking trees gps or ask your own question. What format should I use to report my location to emergency responders? Where do you get GPS tracks (hikes) for southeast Asia? Which types of animals would peel bark off this tree? What is this tree with a spiral shaped trunk in Massachusetts?